11/6/07 Today I ordered the Finish Kit! It should ship sometime around the second week of January. 11/9/07 Tonight Lynne helped me out by helping cut out the firewall insulation I purchased from Abby at Flightline Interiors. She made a pattern using newspaper and we then transferred the pattern to the .025 insulating blanket and cut out with a razor knife. Before I install all the plumbing for the fuel and vent lines I wanted to paint the interior. I taped off the forward cabin area and primed and painted the areas that will be seen after the upholstery is installed. I have Jim Olsen and Dan Miller coming over on Saturday to help install the wings so I made final preparations. 11/10/07 Before the crew arrived I cut the fuel line stubs through the firewall back to 2.50". I shoved as much of the line as possible back inside the fuselage before cutting. I installed the nut and sleeve and then flared both stubs. I worked on the rudder cable covers where they exit the aft fuselage. I dimpled and primed the covers and dimpled the holes in the fuselage. Next, I installed the static line at the F707 bulkhead. I installed platenuts and secured the static line with .025 plastic clamps. Jim and Dan arrived at 5:00 and with Lynne inside the fuselage for ballast we installed the wings. The wings fit tightly but everything lined up perfectly and the hardware store bolts went in with only minor persuasion. 11/11/07 Today I can say I drilled the rear spars! I can also say that I spent 7 hours doing it. I began by leveling the plane laterally along the center section spar carry through and longitudinally along the longerons using my digital level. Next I measured the forward sweep by hanging four plumb bobs off the leading edge and pulling a string to adjust until straight. This is a task that required Lynne's help to hold the tail steady so I could manipulate the wing fore and aft. My plane had a small forward sweep (5/16") but was able to reduce this down to 1/16" (Van's says within 1/2" is fine). After clamping the rear spar I measured from each wingtip to the tailcone and was surprised to find that both wings were EXACTLY the same. Next, in order to set the incidence I had to cut a block of wood 4 5/64" and attach it to my 4' level. I measured at the third inboard rib as well as at the mid-wing on both wings. The incidence was nearly perfect but I adjusted each wing until it was absolutely perfect and clamped again. At each step I would re-check the plane for level, re-check the sweep, re-check the triangulation and re-check the incidence. Finally, it was as ready as it will ever be...time to drill. I cut a piece of 2x4 into a block 1 1/2" x 2" and drilled a 1/8" hole on the drill press. This block was used as a drill guide to ensure a perfectly perpendicular hole through the rear spar. Next, before drilling, I measured 5/8" from all sides and marked the rear spar. All I need to do now is make sure to drill within the lines. I used a punch to mark dead-center and, with the block clamped to the rear spar, Drilled the hole. I then repeated on the left wing spar and clecoed and clamped. Next, I re-checked all the measurements and was relieved to find everything still holding true. I will be enlarging the holes incrementally until I get it to within one step of the final diameter of 5/16" where I will use a reamer to true the hole. 11/12/07 Drilled the rear spar to 5/16" and bolted. I began installing the left aileron. 11/14/07 Installed the right aileron as well as the flaps. I sanded the control "sticks" and painted with the rattle can. 11/16/07 I took the day off from real work today so I could seriously work on the plane. Lynne is out of town as well so I had no distractions. I fabricated the forward attach brackets and bent, clamped and drilled them to the fuselage. I drilled the .025" hole through the T-905. Assembled the VA-256 flap pushrods by roughly cutting them 6 5/8". It is important to cut off equally from both ends in order to preserve the pre-threaded portions. I made the initial holes in the side fuselage and the bottom using a 1/4" drill. I used the Dremel tool to nibble away a little at a time until I could loosely install the flap rod. I used my 12 VDC power supply to raise and lower the flap and determine the interference throughout the flap travel. The routine required removing the flap rod and "nibbling" some more, over and over until it cleared. Next, I attached the aileron alignment tool and adjusted the flap actuator rod until the flap aligned with the aileron in the "full-up" position. After repeating the routine on the right side I measured the flap travel with the digital level and determined it to be 31.6°. The wing root fairings come with the finishing kit but now is a good time to match-drill the F-976 bottom skin to the inboard wing skins. I ordered a #40 Strap Duplicator from Aircraft Spruce and using my "creeper" I slid under the wings and drilled the holes. I had to disassemble the control system in order to get it installed through the floor ribs. This was a real test of dexterity as I crawled inside the cabin and worked to install the bolts, washers and nuts. I clamped the right aileron to the right flap to set the aileron pushrod in it's "fixed" orientation and adjusted the rod bearings on the pushrods to align the control sticks vertically. I am not attempting to get the rigging perfect now since this will all be disassembled. The purpose is to get it roughly rigged and adjusted so when I reassemble at the airport I will only need to "tweak" it for it to be rigged for first flight. The first thing you are supposed to do, according to the plans, is to drill the elevator horns. I will be deferring this task until after I have installed the horizontal stabilizer and elevators. I verified the squareness of the horizontal stabilizer by measuring from the firewall to the rear tip on both sides. I was pleased to find the measurement exactly equal on both sides (171.25"). Next I drilled the HS-908 attach angles after measuring carefully and installed the AN3-10A bolts. I set the incidence by placing a 11/32" drill bit under the rear spar (as per the plans) and drilled the rear spar to the F-711B bars. I then installed the bolts. I measured and cut the F-790 elevator pushrod tube using the dimensions specified in the plans. I taped one end and poured about 8 ounces of Nason primer inside. I taped the other end and swirled the primer inside then poured the primer out and set the tube aside to dry. I repeated the process with the small pushrod. Finally, I pinned the elevators in place and clamped the counterbalance arms to the stabilizer. While I was at it, I bent the trim tab hinge pin and safety wired. 11/17/07 I primed the exterior of the F-790 elevator pushrod as well as the small tube. I measured out the circumference of the fat tube and divided into eight segments. I wrapped the paper around the tube and marked the location for the eight rivets. I inserted the rod ends and drilled to #30. Finally, I installed the MSP-42 pulled rivets. I drilled the elevator horns through the inspection panels by first measuring out the location and drilling to #30. I then cut a block of wood and sanded until it would fit tightly between the two horns. I then removed the block and drilled a #30 hole at the drill press through the block, re-inserted the block between the horns and drilled through to the second horn. Finally, I enlarged the holes to 3/16ths. I installed the rod end bearings into the F-790 pushrod and mounted to the bellcrank and the elevator horns. I adjusted until the bellcrank was vertical. I marked and trimmed the front spar of the VS according to the plans. I then mounted the VS and verified the correct height of the rear spar and clamped. I then verified the VS was vertical by measuring to the tips of the HS (it was dead-on). I spent quite a while verifying the VS was properly aligned then drilled the front spar and clecoed. Next, I drilled the rear spar to the F-712 bulkhead. Then you have to back-drill the four holes in the tie-down bracket through the rear spar. (In order to do this you must first remove the elevators in order to have room to get an angle drill inside the fuselage). Finally, I drilled the holes to full size and bolted the rear spar to the bulkhead. I mounted the rudder and verified I had the proper deflection left and right (35°) and also to check there was no binding or interference. I have installed a neat rudder stop I purchased from fellow builder, Jeff Bordolon. It mounts to the bottom of the lower hinge bracket of the vertical stabilizer and alleviates the need for the ugly rudder stops riveted to the exterior of the fuselage. 11/18/07 Once the rudder was installed, it was apparent I needed to do more trimming on the lower fiberglass fairing. I took my time and trimmed very carefully until I had a nice fit. I also drilled the rear light hole to 1.0" for the Whelen light. I also purchased the LED replacement light from Eric Jones at Perihelion Designs. I then mixed up some epoxy and made a thick slurry with micro balloons and filled the area around the screws. After it dries I will have a built-in nut for the screws. Well, here we have a "mostly" assembled airplane. 11/25/07 Finally got the Thanksgiving guests to leave and worked on plumbing the brake lines as well as the Airflow Performance fuel pump/filter kit. I cut a piece of the soundproofing insulation for the tunnel and will let the fuel and brake lines lay on this for padding. Next, I bent and flared the fuel lines where they will attach to the Andair fuel valve. I then worked on bending and installing the various tubing for the fuel pump. I got stumped when I found out that the fuel pump outlet interferes with the right tank inlet on the valve. 11/26/07 I spoke with Don Rivera at AFP today and he felt the 90 degree fitting was a great solution and would not affect the performance of the IO-360. I installed the fitting with a dab of EZ-Turn and measured, cut and flared the tube and installed. 11/30/07 Tonight I bent and test fit the left vent tubing. I also ground down the threads on the AN832-4D unions and cut the tips 45°. 12/1/07 Bent and test fitted the right side vent tubing. I don't like the light gray powder-coated color of the rudder pedals so I removed the brake pedals and the master cylinders. I then scuffed the powder coating and painted with the hammered gray rattle can. I also riveted platenuts on the brackets that will secure the panel. 12/4/07 Installed the brake pedals onto the rudder assembly and installed in the fuselage. (I installed the assembly one hole back from the fore most install position). 12/6/07 Tonight I glued the NACA vents to the fuselage using E6000 epoxy. I clecoed the F-7107-L&R Forward Fuselage Ribs to the firewall. I also clecoed the F-7105B-L&R Outboard Sub-panels as well as the F-7105A Center Sub-panel. Since I will be hosting our EAA Chapter 1211 Holiday Party at our home again this year, I went ahead and clecoed the panel in for visual appeal. 12/9/07 We had a great EAA1211 Holiday Party here at the house last night. After most of the guests left, I got fellow EAAer and soldering master, Jack Ryan, to solder leads on my micro-switches that will go into my stick grips. After installing heat shrink on the switches I put them away and disassembled the forward fuselage assembly. I fabricated the F-7108B angle as well as the F-7108C and F-721D attach angles. I drilled and clecoed the F-7109 plate and F-7108B angle to the F-7108A center forward fuselage rib then disassembled and deburred. I then measured and drilled the F-746 engine control bracket to the F-7105A subpanel and disassembled and deburred. I decided now would be a good time to drill the F-721A Forward canopy decks and deburr. I then countersunk for rivets. I deburred and scuffed the collection of parts and primed with self-etch. 12/15/07 I finished priming the forward fuselage ribs and sealed with a clear SEM sealer called Chip Guard. 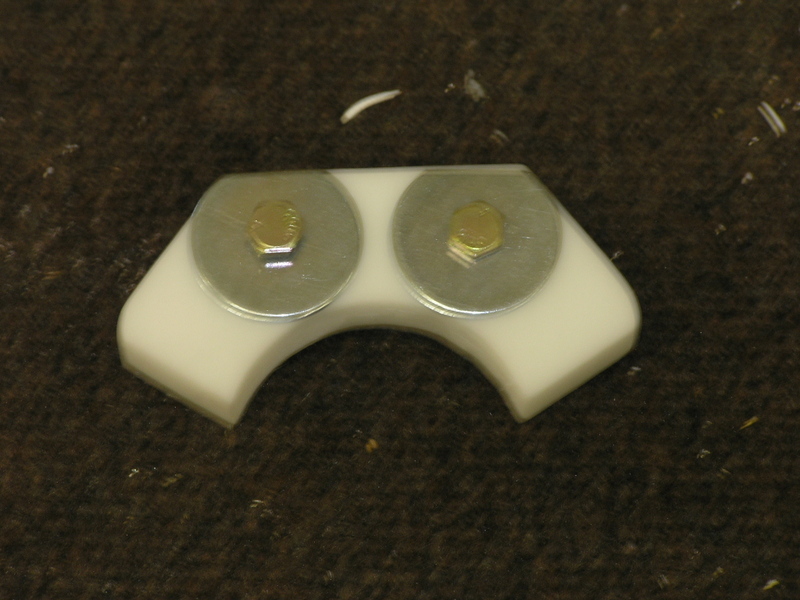 I fabricated a clip that I riveted to the center rudder pedal support bracket. I will attach adel clamps to hold the brake lines. I clecoed the F-7107-L&R forward fuselage ribs and then clecoed the top skin on but left a gap in order to locate the center rib for drilling to the firewall. After careful measuring I drilled, deburred and dimpled the rib and the firewall. Next, I clecoed the top skin to the forward fuselage and match drilled. 12/16/07 I fitted and riveted the forward canopy covers. The plans do not ever mention when to rivet these puppies but I now wish I had waited to rivet the aft canopy decks. The problem is that there is no way to use solid rivets to join them together and in the aft-most rivet location after the aft decks have been installed. Ok well, nothing a few pulled rivets can't fix. I re-installed the panel and drilled the F-721C&D attach angles to the forward canopy decks. After removing the panel I riveted the angles. With all the small tasks completed I riveted the forward canopy section together permanently. The only thing I did not rivet was the flange of the F-7108A center forward fuselage rib to the firewall. After drilling the holes, I discovered I had no way to dimple the firewall. I decided to place an order with Cleaveland Tools for a #30 Pop Rivet Dimple Set. I have officially reached the end of the fuselage plans so technically the structural (aluminum) construction phase is over. I received notification that my finish kit will be delivered sometime during the week of January 7th. All in all, this is pretty good timing. I still have a number of things yet to do to keep me busy until then. 12/21/07 Deburred and dimpled the forward canopy rib flanges. I got the #30 Pop Rivet Dimple Set so I dimpled the holes in the firewall for the center rib and then riveted the rib. I measured and drilled the 2.0" hole for the cabin heat inlet using a hole saw. 12/22/07 I have not yet fabricated the small elevator pushrod that connects the control column to the elevator bellcrank. I went ahead and cut it to the length specified in the plans and drilled and riveted the rod end bearings. I am installing the electric aileron trim option. The system will need to be installed in the center fuselage between the seats so I am holding off installing the small elevator pushrod to give me more room to work. 12/23/07 I fabricated and installed the aileron trim control as well as the Ray Allen servo. While not difficult, the task did require me to crawl into and out of the cabin about 10 times. I went ahead and terminated the servo wires with a 9-pin D-sub male connector. The wires used by RAC are 26 AWG so by doubling up the stripped wire in the pins it is very secure. 12/24/07 Today I drilled and mounted the brake fluid reservoir on the firewall. I also drilled and installed the transponder antenna on the cabin floor in the right front corner next to the vent line bulkhead. I also fabricated a few clips out of scrap .020 for securing the static line along the longerons. We removed the flaps and ailerons. While we were at it I ground down the screw that attaches the rod end to the aileron and Carly used the Dremel to ground out a small notch in the top skins. I fabricated a doubler plate for the Comant CI-122 COM antenna and we drilled it to the fuselage belly under the gear attachment bracket just forward of the spar bulkhead. This places the COM antenna exactly 36" from the transponder antenna. I also started fabricating the magnetometer bracket to attach to the upper F-907 bulkhead. 12/30/07 Finished mounting and drilling the attach bracket for the magnetometer. Cleaned up the shop a little and set up to deburr and dimple the forward top skin. 1/1/08 Happy New Year! Today I finished deburring and dimpling the three fuselage top skins. I also removed the rudder and drilled the lower fiberglass bottom fairing on. 1/12/08 Today I had some help from fellow EAAers Jim Olson, Bill Smith and Jack Ryan to help me remove my wings. The whole process took only 10 minutes and while he was here, I had Jack solder some leads on a micro switch for me. All it cost was lunch. Good deal. Next, I removed the vertical stabilizer, elevators and horizontal stabilizer. I spent the rest of the evening cleaning up and deburring holes. I got confirmation that my Finishing Kit was shipped and should arrive late next week. 1/13/08 Today I removed the flap motor housing in order to paint and also removed the baggage bulkhead. I installed a few odd rivets that I had not installed. I also riveted the rudder cable fairing I got from Avery Tools. I also installed the adel clamp securing the cable guide. I had previously bought some brass screws, washers and nuts at Lowes so I went ahead and installed the magnetometer bracket. 1/18/08 My Finishing Kit arrived today so after unloading, Lynne and I inventoried it and can report that I only had one item missing... Lynne really liked the pink cowl. 1/19/08 I recently received the cool throttle quadrant I ordered from Aircraft Spruce. Today I just knocked a dozen or so small tasks such as drilling wiring access holes in the fuselage for the wing wiring. I also finished storing the various parts in the finishing kit. I finally got around to installing the brake master cylinders and the custom hoses I bought from Brett at Bonaco. I am really impressed with how well they fit and the look with the smoked covering. 4/13/08 I decided to go ahead and install the F-704K upright cap strips since I could see no reason for holding off.